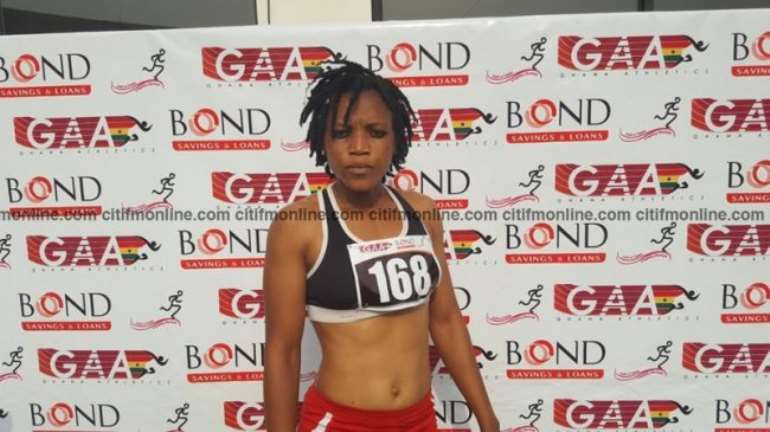 Citi Sports' Fentuo Tahiru has been been following the Ghana Athletics Association's Circuit Championships and he puts down his thoughts on Hor Halutie and her amazing journey up the Ghanaian sprint ladder. At around 11am, the blazing sun inside the Cape Coast Stadium was approaching the epicenter. And while fans in the stands were insouciant about the unforgivable blazing rays, thanks to the giant roof over their heads, the athletes along the running tracks snarled in search of the slightest hint of shade. One of those was 18-year old 100m runner, Hor Halutie. She was tucked away in a small corner, slightly withdrawn from the rest of the crowd, hands in tracksuit pocket, seated and leaning against the wall. “My main focus is to reduce my time,” she told me. The men's 100m Heats were in progress and the announcer had called on the women to get ready. This was Halutie getting ready; zoned out of the crowd, nervously focused, but mightily confident. “I wish I had faster runners in the race. People who have run faster times than me before, going shoulder to shoulder. That will help me push harder,” she said when I asked how she intended to make better times. It was an admission that revealed two things about her: she is fully aware of how good she is compared to her peers locally, and she knows better competition will do a great deal for her development. But Halutie has not always been aware of her potential neither did she possess promise, at least not from the start anyway. Anselm Nyavedzi, Physical Education Teacher at T.I. Ahmadiya Senior High School in the Ashanti Region, recalls when he first saw Hor Halutie run in Ho. This was back in 2014 when Halutie, then only 14, represented the Upper West Region in the Inter-Regional Basic Schools Athletics Competition in the Volta Regional capital. Nyavedzi was scouting for talent for AMASS, a school so famously known for their strong sports athletics program. “There was something about her. She had the right height and looked determined. I liked the fire in her eyes. Although she finished 4th, I could see she put everything into the race. “She gave it her all. And that's why I knew she had the right attitude to succeed,” Nyavedzi said when asked why he chose her despite her abysmal performance in that race. Halutie recalls how she almost missed out on the event that would eventually lead her to where she is now. “During the inter-districts competition in Tumu, I was not feeling well and left camp to go to my village for treatment. I was almost certain to miss out, until one of my coaches sent a message to my mother to beg her to let me come and compete, even if on one leg. “I struggled to get a car to Tumu where the competition was being held. Then we saw a motorbike rider heading there and my mother begged him to take me. That was how Halutie got selected to represent the Upper West Region in Ho. When Halutie returned to Nmanduonu, her village in the Sissala East District of the Upper West Region, the most important thing in her possession was the tiny piece of paper she rolled into the side pocket of her bag. It contained the phone number of Mr. Nyavedzi. “When he asked me if I'd be interested in going AMASS, I was very excited because I had never been to Kumasi before. But it would take more than just a phone call to convince Halutie's parents and all 13 of her siblings that entrusting her in the hands of a man they had never met was a good idea. “Coach Mourinho [Nyadvezi] sent an old school mate to come and meet my family. My father was more willing to let me go but my brothers were reluctant,” Halutie recalled of the meeting. After nearly two hours of meeting and several phone calls to Nyavedzi later, Halutie was finally granted permission to travel to Kumasi to begin her Senior High School education at AMASS, with full athletic scholarship. Halutie's first name, Hor, literally means “metal” in the Sissali language and she needed the full manifestation of the strength her named oozed to pull through a difficult first year at AMASS. “In fact, during her first year, she was not good enough to be part of the AMASS inter-school athletics team and she was struggling to combine school work with all the training. It was all new to her. “But she kept working hard and by the second year, she was our leading female 100m and 200m runner,” Nyavedzi revealed. Once she had truly found her feet, there was not going back. 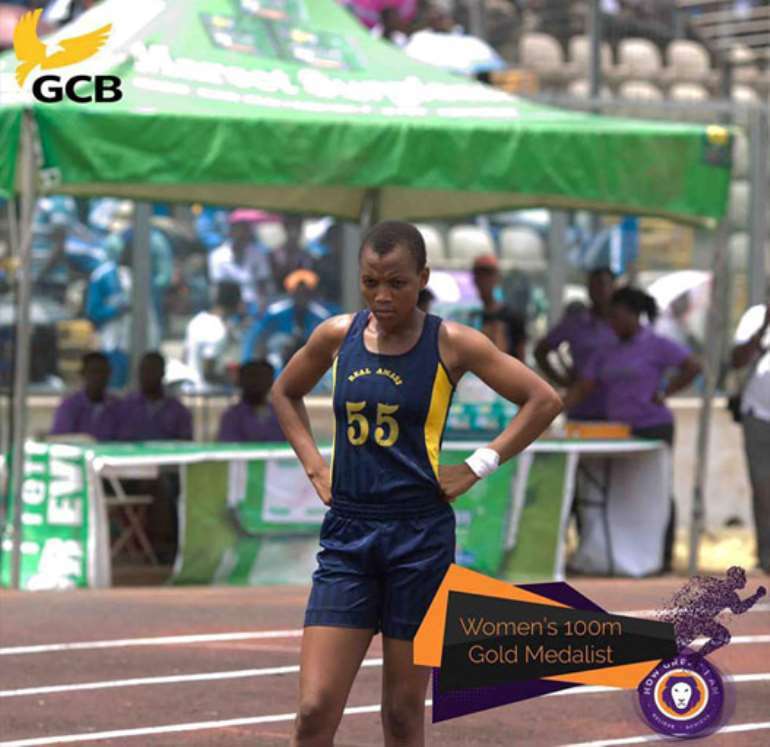 She went on to dominate the Ashanti Regional Inter-Schools athletics competition, winning both the 100m and 200m titles for AMASS in 2016 and 2017. In April 2017, still in final year of high school, Halutie ran a lifetime best of 11.57s at the Ghana Athletics Association's Circuit Championships in Kumasi. It was a time that put her 3rd on the National Ranking in that event only behind experienced Janet Amponsah's 11.32s, Flings Owusu-Agyapong's 11.36s and leveled with Persis William-Mensah. Remarkably, she was not only the youngest in that illustrious company; she was also the only locally-based athlete. Halutie's consistency in the 100m has been enviably stupendous. In the lead up to her record-breaking run in Kumasi, Halutie had done three previous Personal Bests in the same year. At the Tamale Circuit in February, she ran a PB of 11.86s in the heats, and then smashed that in the final with a new PB of 11.75s. Then in the next circuit in March in Accra, she made nonsense of her previous PB with a new PB time of 11.68s before obliterating it a month later in Kumasi. 2018 did not start out quite as exhilarating, with an underwhelming run of 11.71s in the 100m in the Sekondi Championships in January. And while not being a PB, it was still her 3rd best time and her 200m time of 23.85s was a PB and a Championship record. After the Sekondi Championships, Halutie, along with other athletes selected by the GAA, spent nearly a month in camp at Cape Coast and was well-conditioned. Just Because Fitness, the fitness enthusiasts who had taken up sponsorship of Halutie, had also given her strict nutritional regimen to follow. “She said she feels lighter,” Sara Asafu-Adjei, Programs Director of the JBF said of her response to the new nutrition plan. When Cape Coast came around, she was ready. Halutie does not have the fastest starts. She tends to get off the blocks late, a peculiar problem with most Ghanaian sprinters as evidenced by Janet Amponsah's horrendous start at the World Championships in London. But she has a powerful finish. In the end, that was all she needed in Cape Coast as she steamrolled her way to the finish line in a record 11.47s, a new PB and a championship record. The old circuit record of 11.57s was held by Hor Halutie prior to last Saturday's event. It also eclipsed the fastest 100m electronic time run by a local athlete in Ghana by Beatrice Gyaman at the Soga Nana Memorial meet in 2016. Halutie's time is also the fastest any locally-based athlete has ever run on Ghanaian soil since electronic timing began. It was a truly special moment for everyone in the stadium, except Halutie, who at first, did not seem to fully embrace the magnitude of what she had just done. 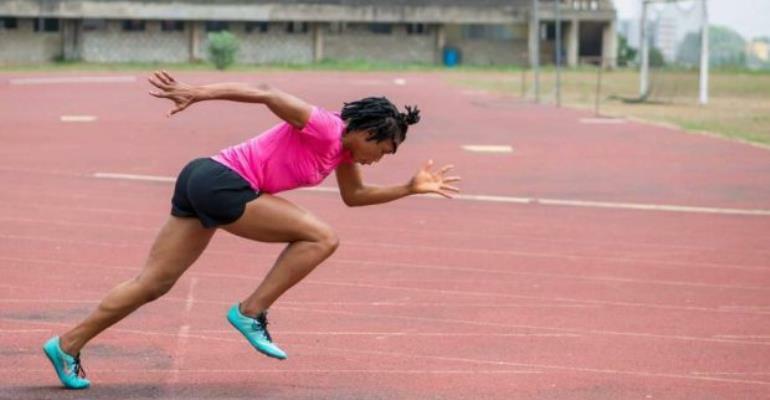 Halutie's 100m records are complemented by records in the 200m and set a new PB and championship record of 23.49s in the Cape Coast, annihilating her own previous record in the same event. 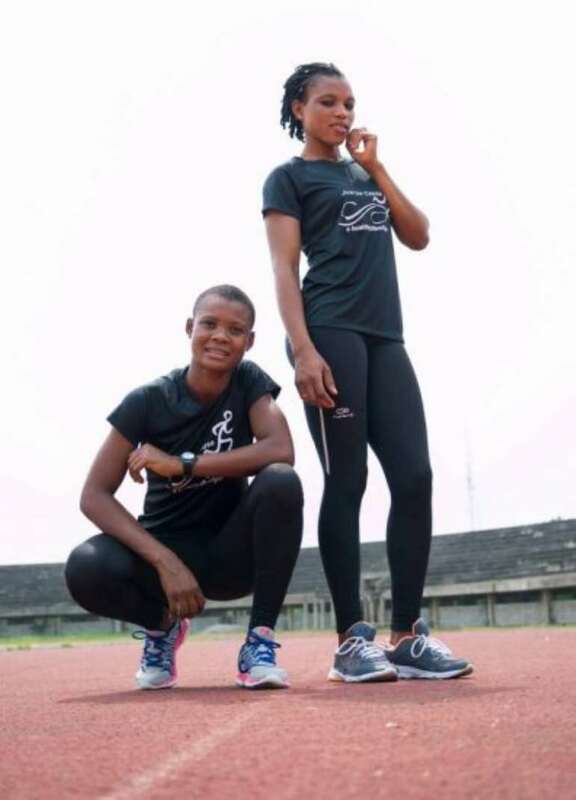 And while Halutie's performances in Cape Coast were not good enough to qualify her for the upcoming Commonwealth Games in Australia (she needed to make the qualification time of 11.30s), she could yet be on her way to the games as part of Ghana's women's 4x100m relay team. “We cannot ignore these performances she put up here in forming our relay team. She will definitely be considered,” Dr. Sylvanus Lamptey, the GAA's vice president, declared at the end of the Cape Coast event. The overwhelming feeling among GAA officials is that Halutie is bludgeoning with lots of potential but will still need perpetual improvement to reach elite levels. Not too long ago, Ghana was considered one of the very best in Africa in the sprint events in athletics. Vida Anim holds the national record in the 100m, set at the 2004 Olympic Games in Athens, Greece with a time of 11.14s, while Vida Nsiah was a trailblazer for women sprints in the country and still holds the national record for the 200m, set in Stuttgart in 1997 with a time of 22.80s. Those were the days of true sprint queens. Since Anim though, the likes of Janet Amponsah and Flings Owusu-Agyepong have shown promises of achieving inspiring feats but none has yet reached the heights of the two Vidas. Janet Amponsah ran 22.90s (PB) in the 200m last year and has a PB 11.29s in the 100m. But once in a while, a talent comes along and gives you hope that, just maybe, the glory days could be on their way back. Halutie has shown that given the right training and environment, she could be the one to bring Ghana's glory days back. A heavy metal is on the move, obliterating everything in its path. What the world can do now is make way for her! 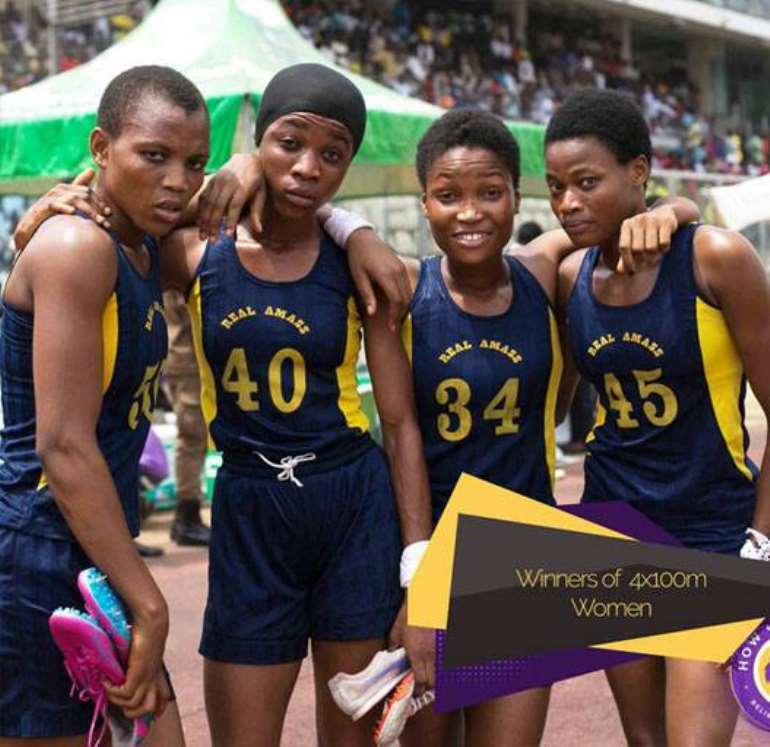 The post Hor Halutie: The making of Ghana's next sprint queen appeared first on Ghana News .